My reading habit really started before I could even read. Apparently, as soon as I could sit up on my own, my favorite pastime was looking through books. My family never invested in a play pen because a stack of books alone could ensure my silence and my rapt attention. I would pick up the first book on the stack and flip through the pages gingerly, setting it down on the opposite side when I was finished with it. When I was done with the stack, I would repeat the process over again. I did not start reading until I was four years old, but the illustrations kept me occupied for hours. When I was six years old, my mother gave me a huge sticker book that contained a summary of each country of the world. I loved matching the country summaries to the stickers of the national flags and country shapes. After reading each and every one, I started to dog-mark the places that I wanted most to visit someday. I found myself going back and back again to Ethiopia – dreaming that I would one day travel there. My obsession went far past my sticker book – as I scoured my mother’s art history books, especially the ones that focused on Biblical topics, looking for paintings of the Queen of Sheba, the mysterious and beautiful queen of Ethiopia. Subsequently during the Open Embassy Day in Berlin, I had an overwhelming desire to visit the Ethiopian Embassy. It was located in a well-off neighborhood outside of the city in an exquisite old German house. Perhaps we just arrived late in the day, but I was surprised that there was almost no activity like in the other embassies – where people were dressed up, serving food, making presentations, and showering me and my friends with attention. I walked through the embassy until I reached a big open room – illuminated by windows, but without a single lamp turned on. In that room sat an Ethiopian woman, who was making coffee over coals. She motioned me over and poured me a cup. As I sipped on the strong coffee, I walked over to a small table, where there was sparse literature about the country. To my dismay, it was all about the suffering of the Ethiopian people, encouraging donations of western individuals, aid organizations, and governments. I found myself saddened by the experience: the country that I had visited so often in my dreams as a child was reduced to a disheveled place where I was supposed to feel sorry for, give some money, and then feel good about myself. 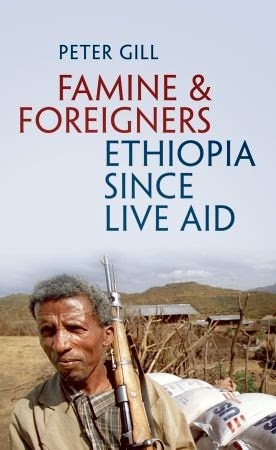 It was perhaps this experience which led me to purchase Peter Gill’s Famine and Foreigners: Ethiopia Since Live Aid, published in 2010 by Oxford University Press. Although I will say that I really did enjoy it, I feel as if this is not the best book for someone with a fairly limited background of the country, as it focuses almost exclusively on the country’s recent history. I was born after the 1985 Live Aid, a concert which utilized star power such as U2, Queen, Joan Baez, and Bob Dylan, to bring awareness and donations to Ethiopian famine relief. To me, this book was geared to an audience who remembered the famine and Live Aid, rather than to an audience without this background, as it seeks to explain the intricacies leading up to and after the famine instead of providing a basic introduction. Ethiopia is a country that is particularly historically noteworthy on the African continent. 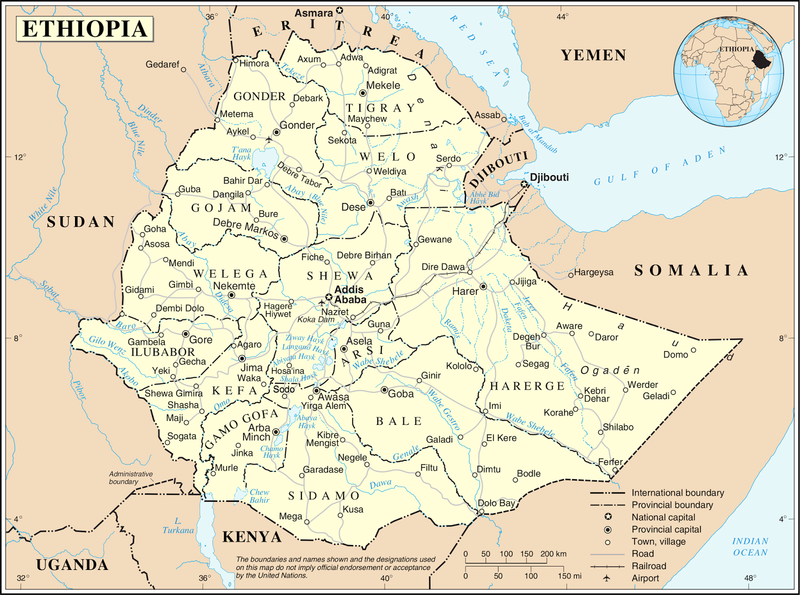 The most populous landlocked country in the world, Ethiopia is located in the conflict-prone region of the Horn of Africa, surrounded by Eritrea, Djibouti, Somalia, Kenya, Sudan, and South Sudan. The Axum kingdom converted to Christianity even before the Roman Empire. It was never colonized by Europeans, but Abyssinia (what Ethiopia was called until a 1974 coup d’etat by the socialist Derg movement) was a prize that was sought by the Italians, and was the victim of Mussolini’s imperial ambitions. For almost twenty years, Ethiopia was a pawn during the Cold War until it transitioned to democracy in the early 1990s. Even in the midst of the Cold War tensions, Ethiopia was a country even further surrounded by conflict (as the Eritreans maintained their fight for independence from 1961-1991) and social strife (as Ethiopia experienced several famines, most notably the 1983-5 famine, which caught the attention of the world.) I also find it necessary to mention that Ethiopia is a multi-ethnic state with over 80 ethnic groups, the four largest being Oromo (34.5%), Amhara (26.9%), Somali (6.2%), and Tigray (6.1%). I am curious to know where you got this Ethiopia political map. I believe it is many years out of date, possibly from about (Western year) 1995, because it reflects the independence of Eritrea but still too many territories. Gonder, Gojam, Welega and many others no longer exist. Instead, the current map has only 9 provinces and 2 Charter Cities, which did not exist prior to (Western year) 2004.